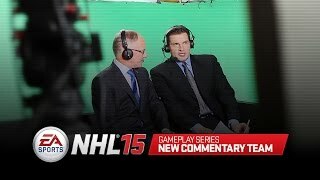 9/4/2014: Meet the new NHL 15 commentary team of of Mike 'Doc' Emrick and Eddie Olczyk. 6/9/2014: First look at NHL 15 gameplay debuted at E3 2014. 5/5/2014: NHL 15 will be skating onto next-gen consoles for the first time.